Volleyball net made of 2.5 mm thick twisted polyethylene cord. Head bond made of 2.5" wide, heavy duty vinyl coated tape. Sides and bottom made of vinyl coated tape. 40' long, 6 mm thick polyethylene cable. 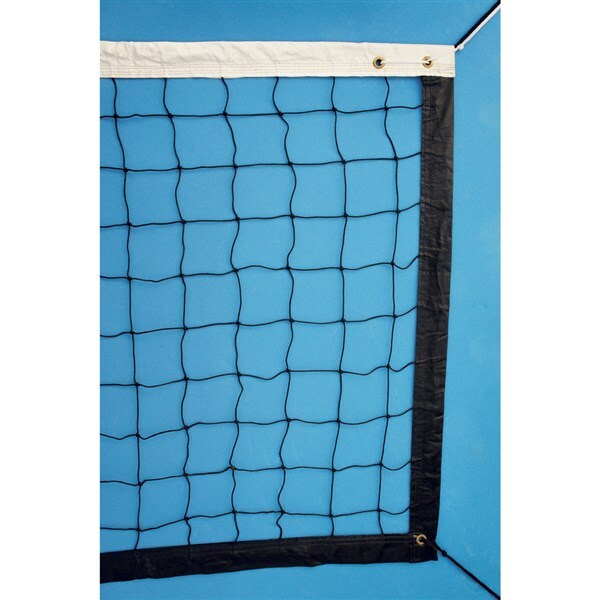 VVBNC25-25304 ...... ...... 25' x 3' x 4"
VVBNC25-27304 ...... ...... 27' x 3' x 4"
VVBNC25-30304 ...... ...... 30' x 3' x 4"
VVBNC25-32304 ...... ...... 32' x 3' x 4"
VVBNC25-32104M ...... ...... 32' x 1m x 4"
Volleyball net made of 2 mm thick twisted polyethylene cord. Head bond made of 2" wide, heavy duty vinyl coated tape. Sides and bottom made of vinyl coated tape. 40' long, 6 mm thick polyethylene cable. VVBNC20-25304 ...... ...... 25' X 3' X 4"
VVBNC20-27304 ...... ...... 27' X 3' X 4"
VVBNC20-30304 ...... ...... 30' X 3' X 4"
VVBNC20-32304 ...... ...... 32' X 3' X 4"
VVBNC20-32104M ...... ...... 32' X 1m X 4"
Volleyball net made of 2.0 mm thick twisted polyethylene cord. Head bond made of 1.5" wide heavy duty vinyl coated tape. Sides and bottom made of vinyl coated tape. 40' long, 6 mm thick polyethylene cable. cable, length 40' with loop, please ask for more details. 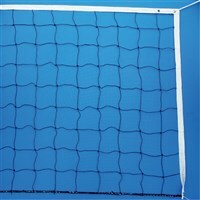 VVBNC20-E25304 ...... ...... 25' X 3' X 4"
VVBNC20-E27304 ...... ...... 27' X 3' X 4"
VVBNC20-E30304 ...... ...... 30' X 3' X 4"
VVBNC20-E32304 ...... ...... 32' X 3' X 4"
VVBNC20-E32104M ...... ...... 32' X 1m X 4"
Volleyball net made of 2.5 mm thick twisted polyethylene cord. Head bond made of 2.5" wide, heavy duty vinyl coated tape. Sides and bottom are over edged. 40' long, 6 mm thick polyethylene cable. VVBNS25-25304 ...... ...... 25' X 3' X 4"
VVBNS25-27304 ...... ...... 27' X 3' X 4"
VVBNS25-30304 ...... ...... 30' X 3' X 4"
VVBNS25-32304 ...... ...... 32' X 3' X 4"
VVBNS25-32104M ...... ...... 32' X 1m X 4"
Volleyball net made of 1.5 mm thick twisted polyethylene cord. Head bond made of 1.5" wide, heavy duty vinyl coated tape. Sides and bottom made of vinyl coated tape. 40' long, 6 mm thick polyethylene cable. VVBNS15-25304 ...... ...... 25' X 3' X 4"
VVBNS15-27304 ...... ...... 27' X 3' X 4"
VVBNS15-30304 ...... ...... 30' X 3' X 4"
VVBNS15-32304 ...... ...... 32' X 3' X 4"
VVBNS15-32104M ...... ...... 32' X 1m X 4"
Volleyball net made of 2.0 mm thick twisted polyethylene cord. 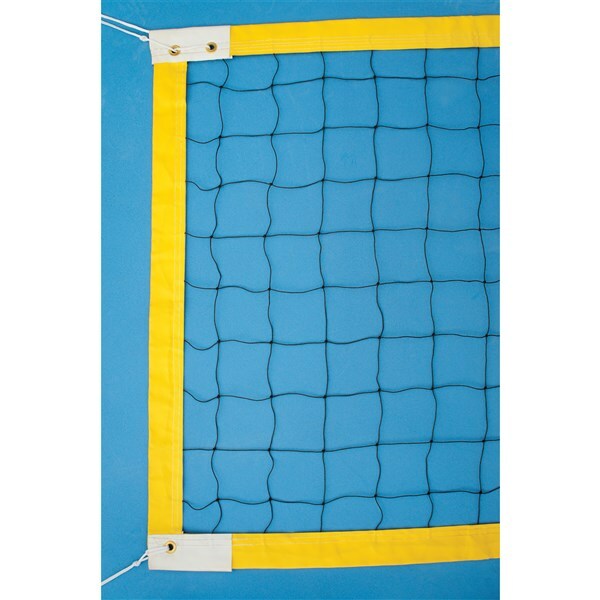 Head bond, sides and bottom made of 2.5" wide, heavy duty vinyl coated tape, yellow colour. Sides and bottom made of vinyl coated tape. 40' long, 6 mm thick polyethylene cable. VVBBC20-321MCR ...... ...... With Rope, Net Size: 32' x 1 m x 4"
VVBBC20-321MCRSC ...... ...... With steel Cable, Net Size: 32' x 1 m x 4"
Volleyball knotted net made of 3 mm thick twisted polyethylene cord. 2.75â€ (70 mm) Top Edging and 1.5â€ (38 mm) Side and Bottom Edging made of heavy duty vinyl coated tape. Sides reinforced with 10 mm fiber rod. Tensioning Cord made of 6 mm Kevlar rope 11.70 m long. 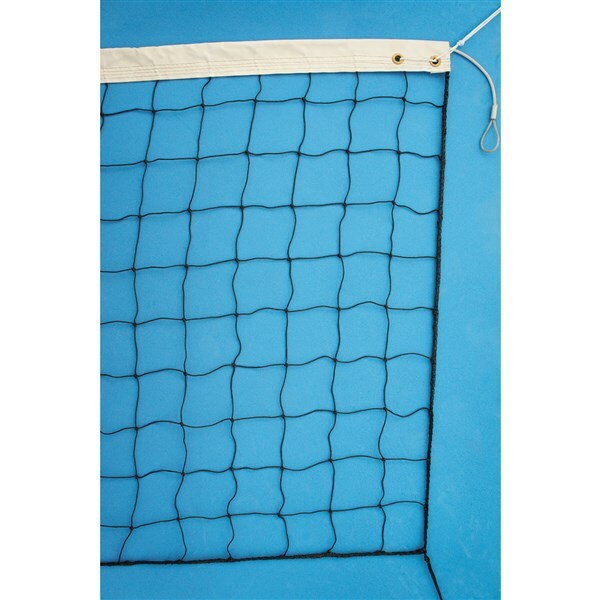 Volleyball knotted net made of 3 mm thick twisted polyethylene cord. 2.75â€ (70 mm) Top Edging and 1.5â€ (38 mm) Side and Bottom Edging made of heavy duty vinyl coated tape. Sides reinforced with 10 mm fiber rod. Tensioning Cord made of 6 mm Steel wire 11.70 m long. 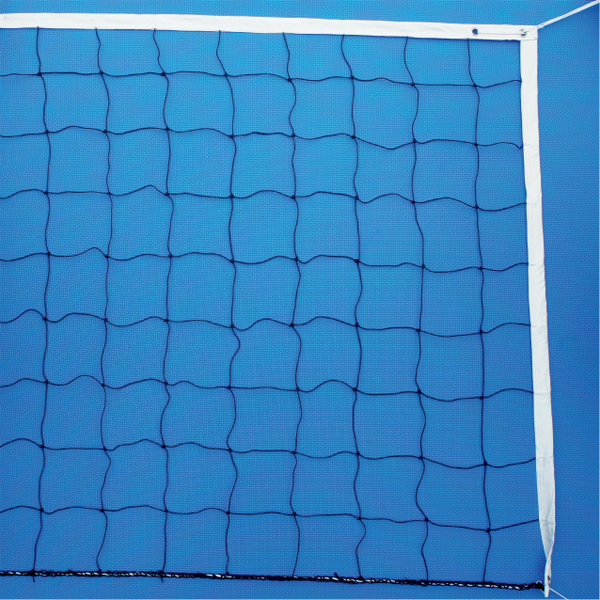 Volleyball knotted net made of 3 mm thick twisted polyethylene cord. 2.75â€ (70 mm) Top Edging and 1.5â€ (38 mm) Side and Bottom Edging made of heavy duty vinyl coated tape. 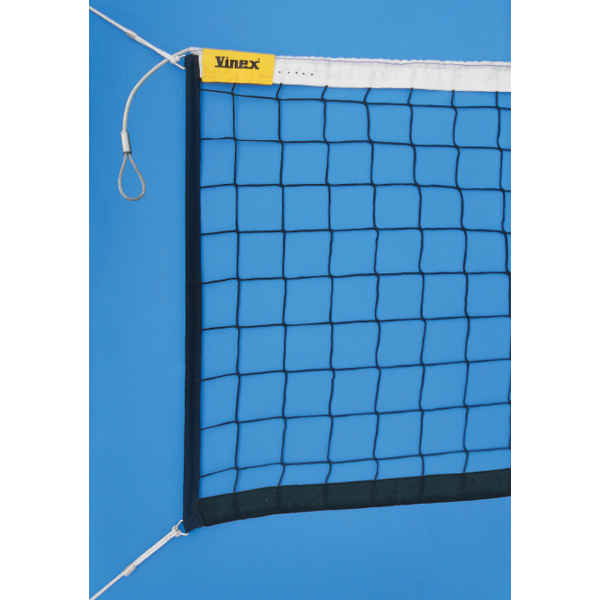 Tensioning Cord made of 6 mm Kevlar rope 11.70 m long. 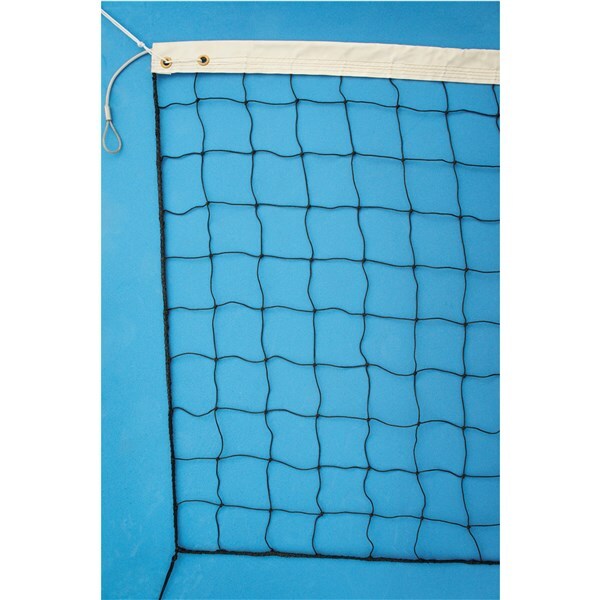 Volleyball knotted net made of 3 mm thick twisted polyethylene cord. Top 2.75â€ (70 mm) Top Edging and 1.5â€ (38 mm) Side and Bottom Edging made of heavy duty vinyl coated tape. Tensioning Cord made of 6 mm Steel wire 11.70 m long. 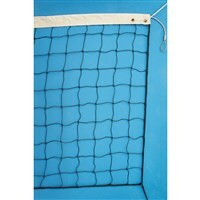 Volleyball knotted net made of 3 mm thick twisted polyethylene cord. 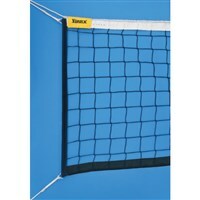 2.75â€ (70 mm) Top Edging and 1.5â€ (38 mm) Side and Bottom Edging made of polypropylene knitted tape. Sides reinforced with 10 mm fiber rod. Tensioning Cord made of 6 mm Kevlar rope 11.70 m long. Volleyball knotted net made of 3 mm thick twisted polyethylene cord. 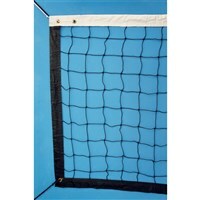 2.75â€ (70 mm) Top Edging and 1.5â€ (38 mm) Side and Bottom Edging made of polypropylene knitted tape. Sides reinforced with 10 mm fiber rod. Tensioning Cord made of 6 mm Steel wire 11.70 m long. 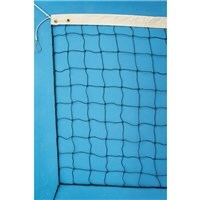 Volleyball knotted net made of 3 mm thick twisted polyethylene cord. 2.75â€ (70 mm) Top Edging and 1.5â€ (38 mm) Side and Bottom Edging made of polypropylene knitted tape. Tensioning Cord made of 6 mm Kevlar rope 11.70 m long. Volleyball knotted net made of 3 mm thick twisted polyethylene cord. 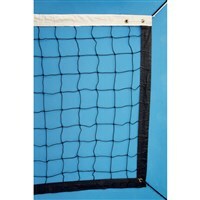 2.75â€ (70 mm) Top Edging and 1.5â€ (38 mm) Side and Bottom Edging made of polypropylene knitted tape. Tensioning Cord made of 6 mm Steel wire 11.70 m long. Volleyball knotless net made of 3.75 mm thick polypropylene cord 2.75â€ (70 mm) Top Edging and 1.5â€ (38 mm) Side and Bottom Edging made of heavy duty vinyl coated tape. Sides reinforced with 10 mm fiber rod. Tensioning Cord made of 6 mm Kevlar rope 11.70 m long. 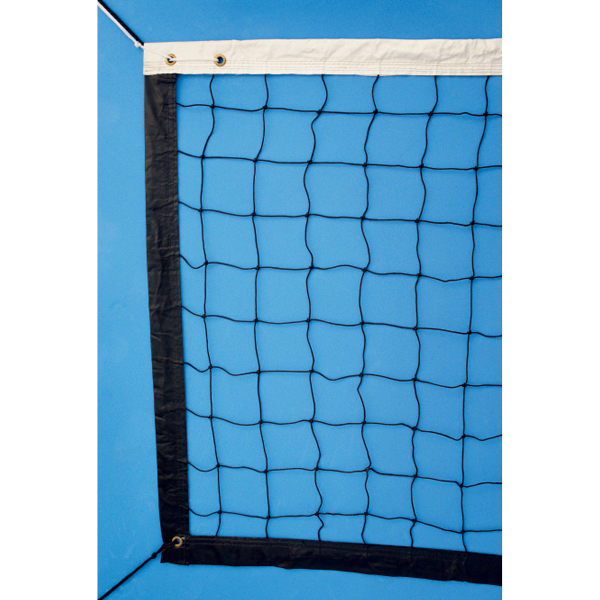 Volleyball knotless net made of 3.75 mm thick polypropylene cord 2.75â€ (70 mm) Top Edging and 1.5â€ (38 mm) Side and Bottom Edging made of heavy duty vinyl coated tape. Sides reinforced with 10 mm fiber rod. Tensioning Cord made 6 mm Steel wire 11.70 m long. Volleyball knotless net made of 3.75 mm thick polypropylene cord 2.75â€ (70 mm) Top Edging and 1.5â€ (38 mm) Side and Bottom Edging made of heavy duty vinyl coated tape. Tensioning Cord made of 6 mm Kevlar rope 11.70 m long. Volleyball knotless net made of 3.75 mm thick polypropylene cord 2.75â€ (70 mm) Top Edging and 1.5â€ (38 mm) Side and Bottom Edging made of heavy duty vinyl coated tape. Tensioning Cord made of 6 mm Steel wire 11.70 m long. 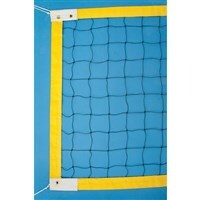 Volleyball knotless net made of 3.75 mm thick polypropylene cord 2.75â€ (70 mm) Top Edging and 1.5â€ (38 mm) Side and Bottom Edging made of polypropylene knitted tape. Sides reinforced with 10 mm fiber rod. Tensioning Cord made of 6 mm Kevlar rope 11.70 m long.